Over at mBricks my colleagues have put a lot of work into the device database (we work with WURFL data and contribute back as well as we can). I took the opportunity to take a closer look at screen size trends. The data I have covers about 400 different device models sold from 2005 to today. This shows the the most significant screen sizes, from the smallest to the largest. I have added a couple of upcoming phones as well, they are the ones with the dotted lines. Over the years the relative screen size difference has increased. The difference between the smallest (128 x 128) and the largest (800 x 480) is now a factor of 23. That means the largest screen is 23 times bigger than the smallest one. You can see that the smaller screens have a portrait orientation and the large screens have a landscape orientation. Between them are the phones that can change orientation, they can work in both landscape and portrait. 240 x 320 is the dominant screen size overall. I did a rough dpi (ppi to be exact) calculation for some popular phone models. The pixel density actually increases when the pixel count increases. The screens are not only getting bigger, they are getting sharper at the same time. There is an upper limit to what dpi is meaningful. At a certain density, the eye can no longer see any difference. If the specs are correct, the upcoming Sony Ericsson Xperia X1 will have a pixel density of 298. That is the highest I've seen on a mobile phone yet. The human eye can resolve about 340 dpi at one foot viewing distance IIRC, but tests show that most people don't see much difference between a 150 and a 300 dpi image. So 298 dpi should be plenty. Unfortunately, for LCD screens, increased pixel density doesn't give us more brightness. More brightness makes the screen easier to read outdoors and is more important than resolution from a usability perspective. OLED displays will help with this, but we are drifting off topic. Yes, a grand total of 26 different screen sizes. I only counted phones that had a color screen, ran Java and had a browser. It is obvious that 240 x 320 (also called QVGA) is on a roll. It is by far the most common and it is growing rapidly. If you develop, this should be your target screen size. When you develop, you primarily need to worry about the width of the screen. For most practical purposes, the height takes care of itself. I have lumped together 176 x 208 and 176 x 220 for this graph. 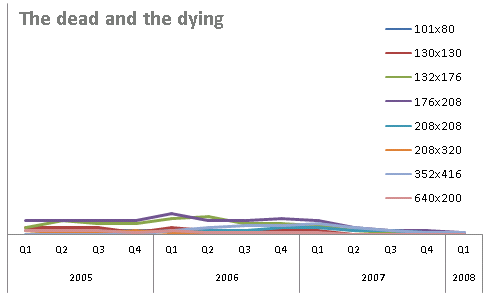 There is still a lot of them in the market, but their numbers have been decreasing since January 2007. In 18 months this screen size may be out of the market. Nokia haven't launched a phone with this screen size in 1,5 years. I have also lumped together 128 x 128 and 128 x 160. Phone screen sizes has had a tendency to come in pairs. Each manufacturer had their own variation on large-screen high-end models and small-screen low-end" models. Everybody+dog: 240 x 320 ? The majority of odd-sized screens are disappearing. No phones with the above screen sizes have been introduced for at least 4 quarters. The dead and dying are partly BenQ-Siemens (who has left the market), partly the old Sony Ericsson P-series and partly the Nokia hires versions: E60/70 and N80/90. What about the other ones, the not so popular, but not dying? These are the ones that do you in. 240x400 LG favorite. Prada and Viewty. 640x480 HTC X7500, Qtek 9000, etc. What will be the dominant screen sizes in the future? Well, the 128 width screen sizes are moving down from feature phones to basic phones and there are very few manufacturers that still uses 176 width screens. It looks like 240 x 320 is the new base line. What will the dominant large screen size be? Let's hope there will be one. Right now there are a lot of different ones, every manufacturer has their own and I can't see a clear trend. The two hottest form factors right now is the handheld touch screens (ala iPhone) and the QWERTY clamshell (ala HTC). For the handhelds, the 320 x 480 iPhone size is a possibility. It has an ok resolution for a 3,5 inch size. The Nokia "Tube" phone will have a 360 x 640 size (my estimate) and is another possibility. For the clamshell form factor, 640 x 480 screen size would be my bet. 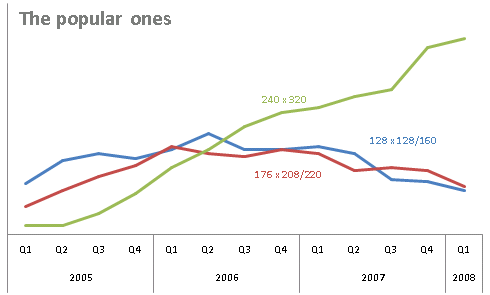 The data includes all the 400 different phone models sold in the Norwegian market from 2005 to 2008. I've given them four quarters of life time past the quarter they were introduced. That means an average of 14,5 months. This might be a little short. I have left out basic phones. Only phones that has a color screen, support for java and a browser are included. The Norwegian market is not very different from most other European markets. It's GSM only, the majority of handsets are sold with 12 month operator binding. 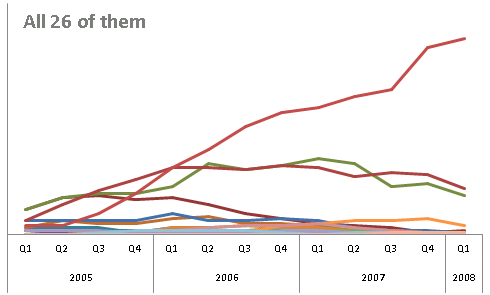 Sony Ericsson, Nokia and Samsung are market leaders. Motorola is weak, HTC is up and coming in the enterprise market. The data includes the iPhone even though it has no official distribution. There is quite a bit of "black" iPhone imports. Reliable sales figures for each individual device is not available, so the data is not weighted on popularity. But I don't think popularity would give a very different conclusion. I've checked "top ten" lists where available and none of the "odd" screen sizes seem to be big sellers. Note: all sizes are written as width x height. So a 240 x 320 screen is portrait while a 320 x 240 screen is landscape. It shows the same clumping and evolution of screen sizes, but also you can mix in other device properties too. This stuff is fast moving... it's cool to track it. Thanks for the compilation of screen resolution research. I'm on the hunt to seek out the true lowest common denominator for website browsing. It may be compulsory to say 1024px wide, but for sites that don't have a .mobi top level domain, there are considerations for those users surfing with wireless devices. Thanks for the great article. I am writing a book about mobile marketing, and wanted to talk to you about using some of your graphs in my book. Can you please email me? First of all, thank you for the results, and especially the graphs. I also work with WURFL and I was wondering how I could use the DB intelligently to run statistics on terminal capabilities. Going anywhere between screen size, J2ME capabilities, FlashLite support, etc. Which you've done I guess, looking at your results and the way you queried your DB. Do you know of a tool that could give me just that: ask WURFL to give me the terminals meeting a certain number of criteria..
Great post, very informative and I agree, it's very well researched. We can use this information in future reviews. :) Great job! This is a great website. I am planning to launch wallpaper downloading service for mobile phones through my website mentioned here. Great Help!!! Excellent research, it is so hard to find good and useful mobile research like this. Thanks! Thanks for that interesting insight! Do you have any similar numbers to colour depth? It would be interesting to have an survey of other technical specifications. My research shew it is really hard to find statistics like this. WURFL is a huge XML file containing all sorts of device details. Philipp: That sounds really interesting! Will any of your results be published? Great post - very well researched and very useful. I've been looking at another issue and yet to find the answer. When working with images/animated gifs - what screen space do the menus (top & bottom) take up in a typical phone, and hence what is the natural resolution of any image displayed non-full screen as it were? Is there any data out there on this?